The north London side have recently got the better of Chelsea and Cardiff City in the top-flight but they face a sterner test against the Citizens, who have dominated the proceedings against them of late. Bernd Leno has been the number one goakeeper for the Gunners since October and there are no concerns regarding his position between the sticks. He should feature in goal. In the defence, Ainsley Maitland-Niles and Laurent Koscielny are likely to return to the mix after respective injury setbacks. Maitland-Niles should feature in the right-back spot with Sead Kolasinac on the opposite end while Koscielny will captain the side with Shkodran Mustafi accompanying him at the heart of the backline. 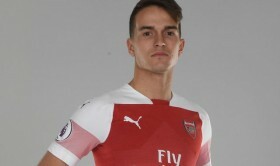 In the midfield, Granit Xhaka should re-enter the fray for league duties after the midweek rest and the Swiss is likely to partner Lucas Torreira and winter signing Denis Suarez, whom the manager has been impressed with in training despite him just arriving at the club. Further forward, Emery should stick with the same attacking combination from recent times and this may witness Aaron Ramsey in the number 10 role with Alexandre Lacazette partnering Pierre-Emerick Aubameyang in the striking department.